The ofuda issued by a shinto shrine. Case of The Kǒjinyama-jinja(ja) (荒神山神社). Dancing scene of the "Ee Ja Nai Ka" movement. Case of the shinto shrine Taga-taisha (多賀大社). The ofuda called Jingū-taima made of IseWashi, issued by Ise Shrine. O-fuda (御札 or お札, o-fuda) is a type of household amulet or talisman, issued by a Shinto shrine, hung in the house for protection, a gofu (護符). It may also be called shinpu (神符). It is made by inscribing the name of a kami and the name of the Shinto shrine or of a representative of the kami on a strip of paper, wood, cloth, or metal. The Ofuda is customarily renewed annually before the end of a year, and then attached to a door, pillar, or ceiling. It may also be placed inside a private shrine (kamidana). It is believed to protect the family in residence from general harm, such as a disease. A more specific o-fuda may be placed near particular objects such as one for kitchen to protect from accidental fire. 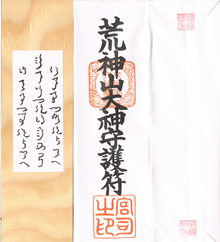 A popular o-fuda called jingū-taima (神宮大麻) or simply taima (大麻) is issued by Ise Shrine. It used to be made from hemp cloth (taima) but nowadays it is made of IseWashi (Washi (Japanese paper) made in Ise) that is blessed and replaced every year — as the use of hemp as a material was common in antiquity. A portable form of o-fuda, commonly called omamori (お守り or 御守, o-mamori) is typically given out wrapped in a small bag made of decorated cloth. This originates from Onmyōdō and Buddhism, but was subsequently adopted by Shintoism. Both Buddhist temples and Shinto shrines give out these o-mamori. While an o-fuda is said to protect a whole family, an o-mamori offers support for personal benefits.